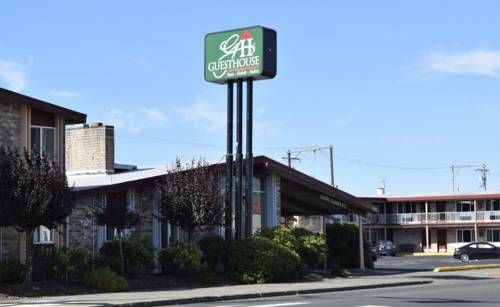 The GuestHouse Inn Aberdeen is conveniently located in downtown Aberdeen, Washington along the Chehalis River. This completely non smoking hotel is within walking distance to many local restaurants. We are only 30 minutes away from both the north and south beaches, Ocean Shores and West Port, where travelers will find clamming, deep sea fishing, kite flying, beach combing, horseback riding, bike riding, enjoying the casinos, or just relaxing. Contact us today to make a reservation. Head east on Airport Way toward Paulson Rd take the first left onto Paulson Rd turn right at W Emerson Ave turn right at Simpson Ave continue onto N Park St turn left at W Heron St inn on left. Head northeast on W Heron St toward S Michigan St Right onto US 101 S toward Cosmopolis. Go West, Young Cadaver! The place where Willie Keil's journey to "The Promised Land" ended is noted on a large historical marker. It was the World's Largest when it was forged in 1941, and remains a classic Roadside photo-op. A large gift shop that's home to Jake the Alligator Man and other unique, random exhibits. One would need a frying pan the size of a bus to scramble this poultry behemoth.